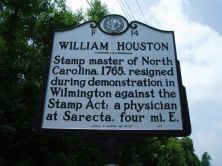 Stamp master of North Carolina, 1765, resigned during demonstration in Wilmington against the Stamp Act; a physician at Sarecta, four mi. 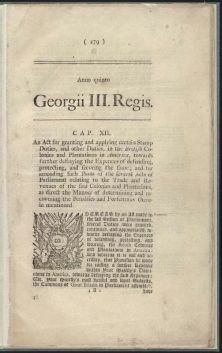 E.
The Stamp Act of 1765, the first direct tax placed on the American colonies by Great Britain, was intended to raise revenue to defray Britain’s national debt in the aftermath of the Seven Years’ War. The measure, however, was met with great disdain within the colonies. In North Carolina that resistance centered on the Crown’s stamp distributors, none more reviled than William Houston. 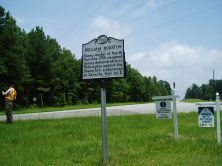 Houston, a Duplin County physician who had arrived in America from Ireland in 1735, was the nephew of wealthy London merchant and land speculator Henry McCulloch. In 1765, after Parliament passed the Stamp Act, Houston was selected as the stamp distributor for North Carolina, most likely as a result of his kinship to McCulloch. His appointment led to public demonstrations and Houston being hanged in effigy in Wilmington, New Bern, and Cross Creek in October 1765. Upon arriving in Wilmington the following month to take his post, Houston was confronted by several hundred protestors led by local political leader John Ashe. Houston publically declared that he “should be very sorry to execute any office disagreeable to the People of the Province.” Unsatisfied with his proclamation, the crowd forced him to the county courthouse where he penned his resignation. Houston’s forced resignation was only one of a series of protests against British policies by North Carolinians in the 1760s and 1770s. Armed mobs forced the resignation of William Pennington, the Royal customs official for the Cape Fear region the following year, and in 1774 the Tea Act was opposed by the ladies of Edenton in what became known as the Edenton Tea Party. The actions culminated in a series of Provincial Congresses and subsequent resolutions, most notably the Halifax Resolves which authorized North Carolina’s delegates to the Continental Congress to support independence. After his resignation, Houston evidently regained a level of respect. The following year, he became clerk of the Committee of Public Claims at New Bern, and in 1768 and 1771 he was appointed a justice of the peace for Duplin County. Houston’s allegiances lay with the Whigs during the Revolution, and he served on a committee established by the state to oversee court-martials. Houston held numerous local political positions in Duplin County after the war until his death in 1795. William S. Powell, ed., Dictionary of North Carolina Biography, III, 212—sketch by W. Michael Golnick, Jr.